2011 - 2012 - 2013 Angie's List "Super Service Award" winner! We are a Kansas City dental practice devoted to restoring and enhancing the natural beauty of your smile using conservative, state-of-the-art procedures that will result in beautiful, long lasting smiles! We view dentistry as a very important part of health care today. Dr. Hodge's excitement towards dentistry is as great today as it was the day he graduated from dental school. The cosmetic scope of dentistry creates new opportunities for both patient and dental professionals in esthetic and restorative dentistry. The ever-constant improvements in materials, techniques and technology make dentistry a perpetual challenge. 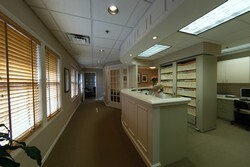 Dr Hodge and his staff derive great personal and professional satisfaction from this continued growth.